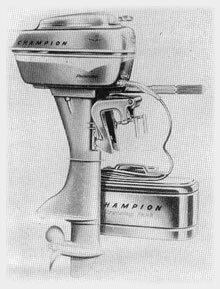 The 1957 Champion model 6N-D is an alternate firing twin of 19.94 cu. in. displacement, capable of 16 1/2 hp. as certified by O.B.C. Its bore and stroke are 2 1/2" by 2 1/32". Forward, neutral, reverse shifting is accomplished with a spring-type power shift clutch designed for smooth operation. The power head, fitted with anti-friction bearings, employs two port type dual rotary valves. It is rubber mounted to isolate vibration from the boat and steering handle. Crankshaft, bearings, connecting rods and pistons are lubricated by a constant pressurized oil bath. The fuel pump is operated by crank case pressure and fuel is lifted from the remote six-gal. tank through a single pressure-less line. The weight of the 6N-D is 58 lbs. Another twin, with bore and stroke identical to those above, is the 6N-HR Hot Rod, weighing 46 lbs., designed for competition. Manufacturer: Champion Motor Co., 1325 N. E. Quincy, Minneapolis, Minn.